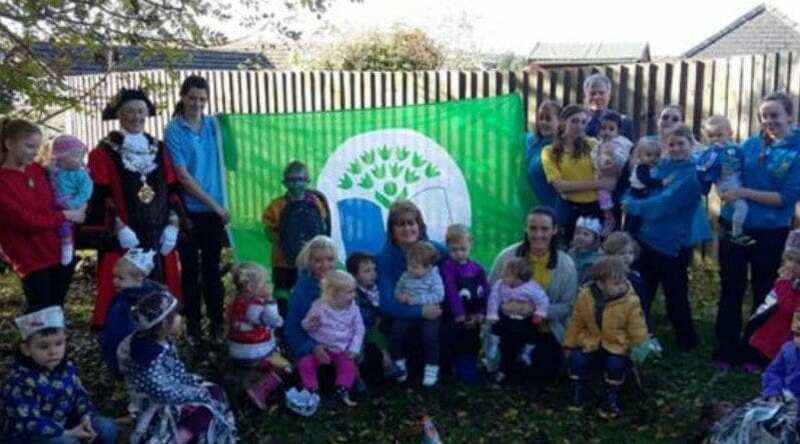 Golden Manor Nursery in Pembroke has recently celebrated receiving its first International Eco Schools Green Flag Award. Eco Schools is run by environmental charity Keep Wales Tidy and is the largest sustainable schools program in the world. Eco Schools is owned by FEE (Foundation of Environmental Education) and is supported by the Welsh Government. Deputy Nursery Manager, Amanda James, has said that they are extremely proud to receive the award, saying it’s a testament to their staff, pupils and parents who have all worked towards getting the award. To celebrate the achievement, the children who attend the nursery dressed in outfits made of recycled materials and performed a Eco Song that they had created, before leading the Mayor of Pembroke and Mayor of Pembroke Dock on a guided tour of the grounds. Pauline Waters, Mayor of Pembroke said that the Eco Song was fantastic to hear and she was impressed with the children, some as young as 3 years old, reminding the staff to switch off lights before leaving a room. Peter Kraus, Mayor of Pembroke Dock, said that it was an honour to attend the celebrations, adding he was overwhelmed by the involvement and understanding that the nursery children had of global sustainability.